If you have a touring Caravan, Motor home or camping facilities and would like to stay in a private, quiet "5 star" touring site then White Lea Farm is just the place. The pleasant south facing site has lawned , individually separated pitches , a water point and waste disposal point. The access driveway down to the farm has been resurfaced with tarmac. Electric connections are available on each pitch. Large or small tents are welcome. A male and female toilet/ shower block is available for use in the main farm yard. 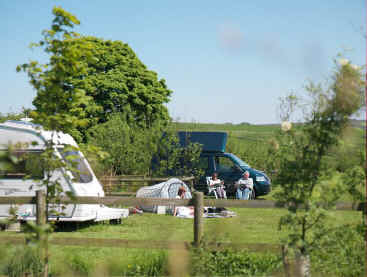 Prices for caravans, campervans, motor homes and trailer tents are for a family £16 per night inc electric. Large groups £6 each. Single tents £6 - Two man tents£12. Come and enjoy the idyllic views of the Peak National Park. Dogs are welcome on a lead.